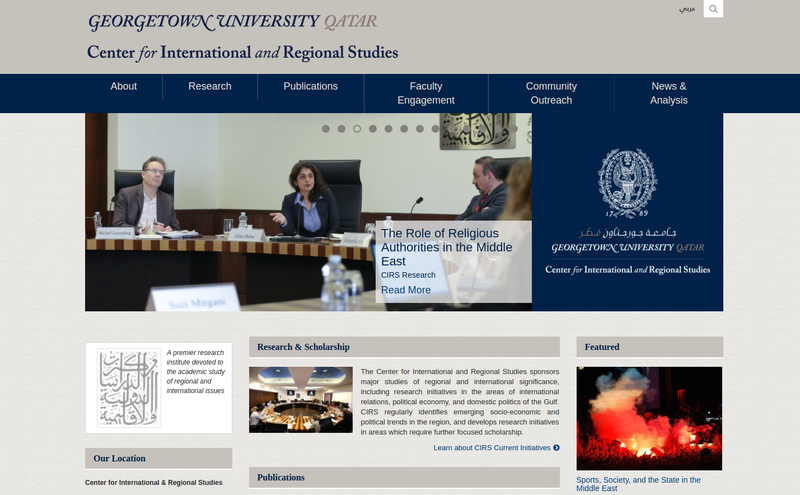 We were contacted by the Georgetown University team in Qatar in late November 2016 regarding several of their sites that were using the Drupal Domain Access module. They had several requirements that they wanted to be met. We hammered out details, then by early February we started rolling with a Site Assessment, monthly retained hours, and some additional hours for anything that went over that lower hourly rate. First, they were experiencing a really curious bug where their page location was being changed when updating or saving a new page. Second, they wanted to migrate the website architecture from using the Drupal Domain Access module to the Drupal core multi-site setup, while also setting up their CIRS site as a multi-site under their main site. Third, they wanted to split the shared current theme into two separate themes. Fourth, they wanted us to migrate all the CIRS content and configuration to its own separate, along with removing the CIRS content and config from their main site. Fifth, migrate Administrators, content editors and user profiles for the current CIRS website to the new website, retain some roles on the main site, and make sure functionality exists for both. We're mostly through most of those items, but still working on the fourth and fifth requirement. But so far everything is running smoothly and on schedule! We'll keep you updated with the end result, once we get them all squared away.